Set in London’s East End in the Summer of 1981, it's a musical comedy telling the tale of Cathy Price, a hairdresser and lover of romantic fiction.She thinks she has found her soulmate in new boyfriend, Tony Wickham, but Tony hasn't told her about his gambling debts. Will he manage to marry Cathy and get his hands on her bank account, or will their best man Danny, who secretly loves Cathy, speak out and risk all for love, or keep quiet and watch his true love marry the wrong man? Written specifically to appeal to amateur groups with a well-balanced cast and has potential for simple staging and costuming. The plot is based around the pupils of Class 5D at Grangebourne Secondary Modern who are celebrating their last days at school. It’s a story of unrequited love, honour and sacrifice, recollection and reminiscence, betrayal and forgiveness, all played out against the backdrop of the class being re-united through a tragedy over 20 years later, together with a reunion of another sort entirely. 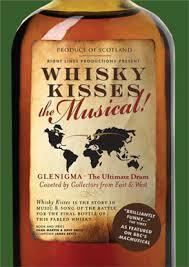 This marvellous new musical is based on the true story of what happened (with a bit of artistic licence) when a ship containing 50,000 cases of whisky runs aground on a remote Scottish island in 1943. Adapted from Compton Mackenzie's novel, this musical has had two very successful productions at the Pitlochry Festival Theatre in 2009 and 2011. Licensing for amateur groups only. To anyone who loves music theatre, 'G&S' means melody, irreverence, wit and fun. Essgee Entertainment has thoroughly updated the Victorian operetta allowing today's theatregoer a fresh look at this classic. All the original songs and tunes are included though and despite the 'pop feel' of many of the chorus numbers the most beautiful solos are untouched. The end product is true to the spirit of Gilbert and Sullivan, but much more accessible for today’s audiences. A musical farce specially written for amateur musical groups with largely female memberships. A therapy clinic for celebrities, down on its luck with no celebrities and no staff, is forced to take in a bunch of old folks as their Home has become uninhabitable. A mystery celebrity phones to check in, and it's all hands to the pumps to try and convince her and her entourage that the place is well run and managed; when in fact it's the old folk who are gearing up to administer their own bizarre range of alternative therapies. The class of '65 hold a school re-union in a hotel during which two old pupils are revealed to be bank robbers, some old flames are re-kindled and some new romances are started. Set in the early 1970’s, has eleven fabulous songs (inc Burglars Bungle, Gonna Be Rich, Power To The Petals etc) and The Hockey Whack Thwack dance routine! Enjoy a real nostalgia treat with this gently humorous, hugely entertaining, piece of escapism. Set to a backdrop of over fifteen hits of the 50s and 60's, we follow the trials and tribulations of Eric Dobbins, the dryly nonchalant publican, and his matriarchal wife, Iris (a stereotypical landlady), as they, their staff and their regulars fight to save the pub from the unscrupulous hands of the brewery manager who sees it as a potential lap-dancing venue. Requires a small cast and a three-piece band. A 'backstage musical' which embraces many of the clichés of the genre - and turns them on their head. It could almost be described as a something of a parody musical, with some elements of pastiche, and with its tongue firmly in its cheek. A high-energy show, with more than its share of high kicking chorus numbers, but the score also includes some tender ballads and some funky, jazz numbers which reflect the story's New York setting. Can anyone stop the Evil Queen from killing Snow White and gaining total control of everything? Yes, hurrah - Prince Rupert saves the day. In this version of the Snow White story, the Evil Queen, named Malexandria, takes centre stage along with her human mirror and stylist, Cedric The Hairdresser. After killing her sister (the former queen and Snow White's mother), Malexandria marries the widowed king and sets out to make herself the sole ruler of the kingdom. The songs are gloriously set to the music of Beethoven. 'The Audition' is a short, simple musical to perform either as a festival or fund-raiser piece, or as a 'try-out' for new Directors or performers. Intrigue and passion abound as three lady members of an amateur musical society audition for the leading role in their next production. It has elements of G&S as well as music redolent of a 1950's 'end-of-the pier' show. Great fun to perform and great fun for an audience to watch. Bernard J Taylor has taken some of the best tunes from the G&S songbook and has adapted and updated them in this glorious musical pastiche. It's a modern story of love, duty and power struggles - possibly the type of show G&S would have written about had they still been alive! There are some 'in jokes' for those who are familiar with Gilbert and Sullivan, but overall the show has enough humour and familiar melodies to be enjoyed even by those who are not particularly familiar with their works. EssGee Entertainment's musical theatre adaptation of 'The Mikado' takes the gentle humour of Gilbert's original words and introduces, additional more modern elements to maintain the interest of a contemporary audience. A number of the principals have some very funny lines to deliver, often during business which verges on pantomime. Two international whisky collectors converge on a remote Highland distillery to compete for the last remaining bottle of a fabled malt whisky - The Glenigma! At the auction, the stakes are high, but is this simply a battle for a bottle, or will the unique Scottish experience change everyone's lives forever?